Our mission is to use the heterogeneity of myeloid cells (MCs) as an in vivo sensor to track inflammatory responses and as a target for therapeutic intervention. Based on markers that allow discrimination between selected MC subpopulations, we fully invest in the development of innovative tools to visualize and modulate the in vivo differentiation, recruitment and function of selected MC subpopulations in inflamed tissues. 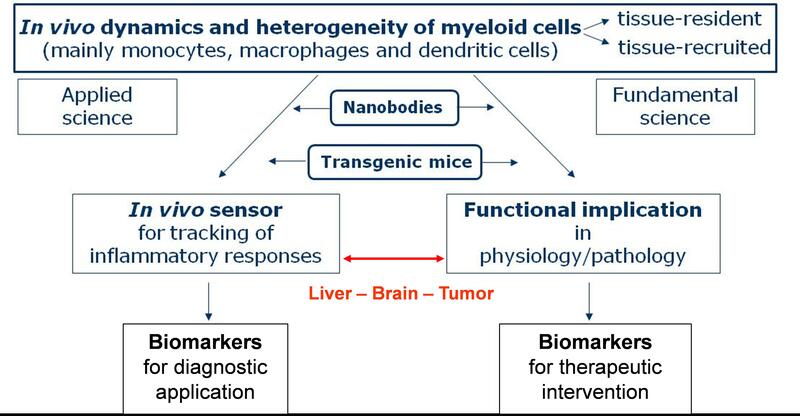 These include in particular the identification of markers for different tumor-associated macrophage or dendritic cell populations, as well as Kupffer cell- and microglia-specific markers, to generate transgenic (knock-in) mice allowing the tracking and ablation of selected MC populations. Such tools will reveal the role of these MCs in homeostasis and in distinct models of tumor growth and liver or brain injury. We also aim to develop original strategies to overcome inflammation-associated immunopathology of infectious and non-infectious diseases. In this regard, we fully exploit the strategic advantage of nanobodies, i.e. camelid-derived single-domain antibody fragments and their engineering platform as tools for in vivo MC-targeted delivery of imaging agents (radionuclides, gold- or magnetic nanoparticles) and drugs that can remediate the inflammatory disease outcome and be translated readily into the clinic. Tumor immunology, with a particular focus on the role of myeloid cells (mainly macrophages and dendritic cells) in the tumor microenvironment. Liver immunology, with a particular focus on the role of tissue-resident Kupffer cells versus bone marrow-derived myeloid cells during parasitic infections (mainly Trypanosoma), bacterial infections (mainly Listeria) and sterile liver inflammation (including liver cancer). Knock-in mice to specifically study the role of Kupffer cells were generated. Brain immunology, with a particular focus on the role of tissue-resident microglia versus bone marrow-derived myeloid cells during infectious inflammation (Trypanosoma, Listeria), glioma and neuronal wiring. The use of Nanobodies and their engineering platform for the imaging and therapeutic targeting of myeloid cells in vivo. Laoui D*, Keirsse J* et al.The tumour microenvironment harbours ontogenically distinct dendritic cell populations with opposing effects on tumour immunity. Van Overmeire E et al. M-CSF and GM-CSF Receptor Signaling Differentially Regulate Monocyte Maturation and Macrophage Polarization in the Tumor Microenvironment. Stijlemans B et al. MIF-Mediated Hemodilution Promotes Pathogenic Anemia in Experimental African Trypanosomosis. Scott CL et al. Bone marrow-derived monocytes give rise to self-renewing and fully differentiated Kupffer cells. Laoui D et al. Tumor hypoxia does not drive differentiation of tumor-associated macrophages but rather fine-tunes the M2-like macrophage population. Cancer Research, 74, 24-30, 2014. For publications with IRC as the affiliation, click here. For all publications, click here.